The client computers in your branch offices are running either Windows® 8 or Windows® 7. BranchCache is a wide area network (WAN) bandwidth optimization technology that is included in some editions of the Windows Server® 2012 and Windows® 8 operating systems, as well as in some editions of Windows Server® 2008 R2 and Windows® 7. To optimize WAN bandwidth when users access content on remote servers, BranchCache copies content from your main office or hosted cloud content servers and caches the content at branch office locations, allowing client computers at branch offices to access the content locally rather than over the WAN. At branch offices, content is stored either on servers that are configured to host the cache or, when no server is available in the branch office, on client computers that are running Windows 8 or Windows 7. After a client computer requests and receives content from the main office and the content is cached at the branch office, other computers at the same branch office can obtain the content locally rather than downloading the content from the content server over the WAN link. Distributed cache mode operates on a single subnet. At a multiple-subnet branch office that is configured for distributed cache mode, a file downloaded to one subnet cannot be shared with client computers on other subnets. Because of this, clients on other subnets, unable to discover that the file has already been downloaded, get the file from the main office content server, using WAN bandwidth in the process. When you deploy hosted cache mode, however, this is not the case - all clients in a multiple-subnet branch office can access a single cache, which is stored on the hosted cache server, even if the clients are on different subnets. 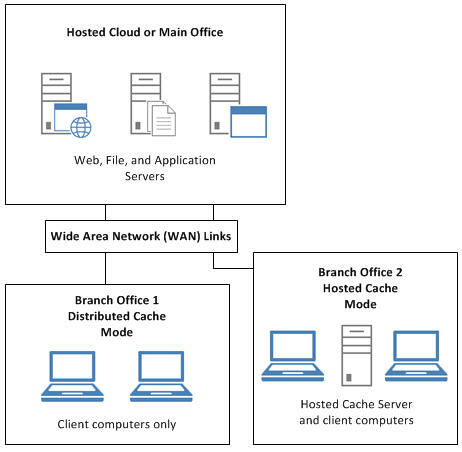 In addition, BranchCache in Windows Server 2012 provides the ability to deploy more than one hosted cache server per branch office. Only source content – that is, content that client computers initially obtain from a BranchCache-enabled content server – is accelerated by BranchCache. Content that client computers obtain directly from other sources, such as Web servers on the Internet or Windows Update, is not cached by client computers or hosted cache servers and then shared with other computers in the branch office. If you want to accelerate Windows Update content, however, you can install a Windows Server Update Services (WSUS) application server at your main office and configure it as a BranchCache content server. Supported Web servers include computers that are running Windows Server 2012 or Windows Server® 2008 R2 that have the Web Server (IIS) server role installed and that use Hypertext Transfer Protocol (HTTP) or HTTP Secure (HTTPS). In addition, the Web server must have the BranchCache feature installed. For more information about Web Server (IIS) in Windows Server 2012, see Web Server (IIS). Supported file servers include computers that are running Windows Server 2012 or Windows Server 2008 R2 that have the File Services server role and the BranchCache for Network Files role service installed. These file servers use Server Message Block (SMB) to exchange information between computers. After you complete installation of your file server, you must also share folders and enable hash generation for shared folders by using Group Policy or Local Computer Policy to enable BranchCache. For more information about File and Storage Services in Windows Server 2012, see File and Storage Services. Supported application servers include computers that are running Windows Server 2012 or Windows Server 2008 R2 with Background Intelligent Transfer Service (BITS) installed and enabled. In addition, the application server must have the BranchCache feature installed. For example, you can deploy Microsoft Windows Server Update Services (WSUS) and Microsoft System Center Configuration Manager Branch Distribution Point servers as BranchCache content servers. The cloud has enormous potential to reduce operational expenses and achieve new levels of scale, but moving workloads away from the people who depend on them can increase networking costs and hurt productivity. Users expect high performance and don’t care where their applications and data are hosted. BranchCache can improve the performance of networked applications and reduce bandwidth consumption with a shared cache of data. It improves productivity in branch offices and in headquarters, where workers are using servers that are deployed in the cloud. For more information about cloud technologies in Windows Server 2012, see Building Your Cloud Infrastructure. Content information that is compatible with computers running Windows Server 2012 and Windows 8 is called version 2, or V2. V2 content information uses smaller, variable-sized segments that are more tolerant to changes within a file. This increases the probability that segments from an older version of the file can be reused when users access an updated version, causing them to retrieve only the changed portion of the file from the content server, and using less WAN bandwidth. In the table below, the acronym “OS” means operating system. When you have content servers and hosted cache servers that are running Windows Server 2012, they use the content information version that is appropriate based on the operating system of the BranchCache client that requests information. When computers running Windows Server 2012 and Windows 8 request content, the content and hosted cache servers use V2 content information; when computers running Windows Server 2008 R2 and Windows 7 request content, the content and hosted cache servers use V1 content information. When you deploy BranchCache in distributed cache mode, clients that use different content information versions do not share content with each other. When branch office users modify or update the contents of documents, their changes are written directly to the content server in the main office without BranchCache’s involvement. This is true whether the user downloaded the document from the content server or obtained it from either a hosted or distributed cache in the branch office. You can use Server Manager in Windows Server 2012 to install either the BranchCache feature or the BranchCache for Network Files role service of the File Services server role. You can use the following table to determine whether to install the role service or the feature. On the wizard page Select Server Roles, if you are installing a BranchCache-enabled file server, select File Services. Later in the wizard configuration process, also select BranchCache for Network Files. If you do not want to install a BranchCache-enabled file server, do not install the File Services role with the BranchCache for Network Files role service. On the wizard page Select features, if you are installing a content server that is not a file server or you are installing a hosted cache server, select BranchCache. If you do not want to install a content server other than a file server or a hosted cache server, do not install the BranchCache feature. The Windows Server 2012 family of operating systems can be used as BranchCache content servers. BranchCache is not supported in Server Core installations of Windows Server® 2008 R2 Enterprise with Hyper-V.
BranchCache is not supported in Server Core installations of Windows Server® 2008 R2 Datacenter with Hyper-V. The Windows Server 2012 family of operating systems can be used as BranchCache hosted cache servers. The content server then sends the content information to the client computer using the same protocol as would have been used for the actual content. For example, if the client computer requested a Web page over HTTP, the content server sends the content information using HTTP. Because of this, the wire-level security guarantees of the content and the content information are identical. HoHoDk = HMAC(Kp, HoD + C), where C is the ASCII string “MS_P2P_CACHING” with NUL terminator. The primary threat at this layer is the risk to the Segment Secret, however BranchCache encrypts the content data blocks to protect the Segment Secret. BranchCache does this by using the encryption key that is derived from the Segment Secret of the content segment within which the content blocks are located. This approach ensures that an entity that is not in possession of the server secret cannot discover the actual content in a data block. The Segment Secret is treated with the same degree of security as the plaintext segment itself, because knowledge of the Segment Secret for a given segment enables an entity to obtain the segment from peers and then decrypt it. Knowledge of the Server Secret does not immediately yield any particular plaintext but can be used to derive certain types of data from the cipher text and then to possibly expose some partially known data to a brute-force guessing attack. The server secret, therefore, should be kept confidential. Upon receiving a valid request message from a client, the content host checks whether the block specified in the request exists in the content host’s content cache. Before BranchCache sends content information or content, the data is encrypted. BranchCache encrypts the block in the response message. In Windows 7, the default encryption algorithm that BranchCache uses is AES-128, the encryption key is Ke, and the key size is 128 bits, as dictated by the encryption algorithm. BranchCache generates an initialization vector that is suitable for the encryption algorithm and uses the encryption key to encrypt the block. BranchCache then records the encryption algorithm and the initialization vector in the message. Servers and clients never exchange, share, or send each other the encryption key. The client receives the encryption key from the content server that hosts the source content. Then, using the encryption algorithm and initialization vector it received from the server, it decrypts the block. There is no other explicit authentication or authorization built into the download protocol. When client computers are configured with hosted cache mode, they add content to their own local cache and also offer data to the hosted cache server. The Hosted Cache Protocol provides a mechanism for clients to inform the hosted cache server about content and segment availability. To upload content to the hosted cache server, the client informs the server that it has a segment that is available. The hosted cache server then retrieves all of the content information that is associated with the offered segment, and downloads the blocks within the segment that it actually needs. This process is repeated until the client has no more segments to offer the hosted cache server. Hosted cache servers that are running Windows Server 2012 do not require a hosted cache server certificate and associated private key. The client computer is configured with the computer name of the hosted cache server and the Transmission Control Protocol (TCP) port number upon which the hosted cache server is listening for BranchCache traffic. The hosted cache server’s certificate is bound to this port. The computer name of the hosted cache server can be a fully qualified domain name (FQDN), if the hosted cache server is a domain member computer; or it can be the NetBIOS name of the computer if the hosted cache server is not a domain member. The process of adding content to the hosted cache server’s cache in a branch office begins when the client sends an INITIAL_OFFER_MESSAGE, which includes the Segment ID. The Segment ID in the INITIAL_OFFER_MESSAGE request is used to retrieve the corresponding segment Hash of Data, list of block hashes, and the Segment Secret from the hosted cache server’s block cache. If the hosted cache server already has all the content information for a particular segment, the response to the INITIAL_OFFER_MESSAGE will be OK, and no request to download blocks occurs. A secondary threat to data stored in the BranchCache is information disclosure. In distributed cache mode, the client caches only the content that it has requested itself; however, that data is stored in clear text, and might be at risk. To help restrict cache access to the BranchCache Service only, the local cache is protected by file system permissions that are specified in an ACL. Although the ACL is effective in preventing unauthorized users from accessing the cache, it is possible for a user with administrative privileges to gain access to the cache by manually changing the permissions that are specified in the ACL. BranchCache does not protect against the malicious use of an administrative account. Data that is stored in the content cache is not encrypted, so if data leakage is a concern, you can use encryption technologies such as BitLocker or the Encrypting File System (EFS). The local cache that is used by BranchCache does not increase the information disclosure threat borne by a computer in the branch office; the cache contains only copies of files that reside unencrypted elsewhere on the disk. Encrypting the entire disk is particularly important in environments in which the physical security of the clients is difficult to ensure. For example, encrypting the entire disk helps to secure sensitive data on mobile computers that might be removed from the branch office environment. Hosted cache servers that are running Windows Server 2012 encrypt all data in the cache by default, so the use of additional encryption technologies is not required.